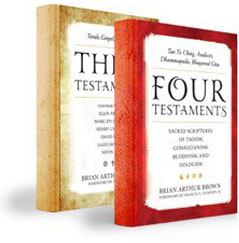 Brian Arthur Brown is the contributing editor of Three Testaments: Torah, Gospel and Quran, and author of the 12 contextual chapters linking Books I through III. Texts with introductions and prefaces by six leading authorities in the three religious traditions: Ellen Frankel, Marc Brettler, Henry Carrigan, David Bruce, Laleh Bakhtiar and Nevin Reda. The foreword is by Amir Hussain, editor of the Journal of the American Academy of Religion. The Scriptures are licensed by the Jewish Publication Society, Sheed & Ward Catholic Books and Kazi Islamic Publications USA. Both volumes are published by Rowman and Littlefield. 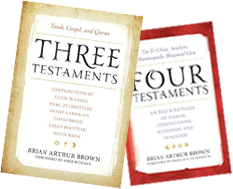 Dr. Brown is also the chapters author of Books I through VII in Four Testaments: Tao Te Ching, Analects, Dhammapada, Bhagavad Gita. Introductory commentary by seven leading scholars in these fields: David Bruce, E. K. Eduljee, Richard Freund, Cyril Glasse, Victor Mair, Jacqueline Mates-Muchin and Arvind Sharma, with materials also from M. Gandhi and S. Radhakrishnan. The foreword is by Francis X. Clooney, SJ, Director of the Center for the Study of World Religions at Harvard University. The Tao Te Ching is licensed by Random House and the other scriptures are in the public domain.